Until just a few years ago, I was like most non-fiction authors in that I'd accumulated an enormous collection of notebooks (think bookcases full) and file cabinets filled to bursting with folders full of clippings and photocopies referenced in my work. I knew something needed to change or else I'd soon need to rent a storage space for all of the paper that was squeezing my family out of our house. I'm not exactly a technophobe, but I'm certainly a bit tech-wary when it comes to learning and implementing new systems and software that would essentially eliminate my old and familiar way of doing things. Despite that, I decided to give an app called Evernote a try and found that my writing life changed exponentially for the better. Evernote is a flexible note organizing system that can help to keep even the most unruly brain focused. One starts by creating "notebooks" for certain subjects or topics and then grouping the related notebooks together to form "stacks". I have one notebook for each book project I'm currently working on and one for each movie script. Those are then "stacked" under the simple group headers of Books and Screenplays. Whenever I have an idea that may help a specific project in some way, I add it to that project's notebook. 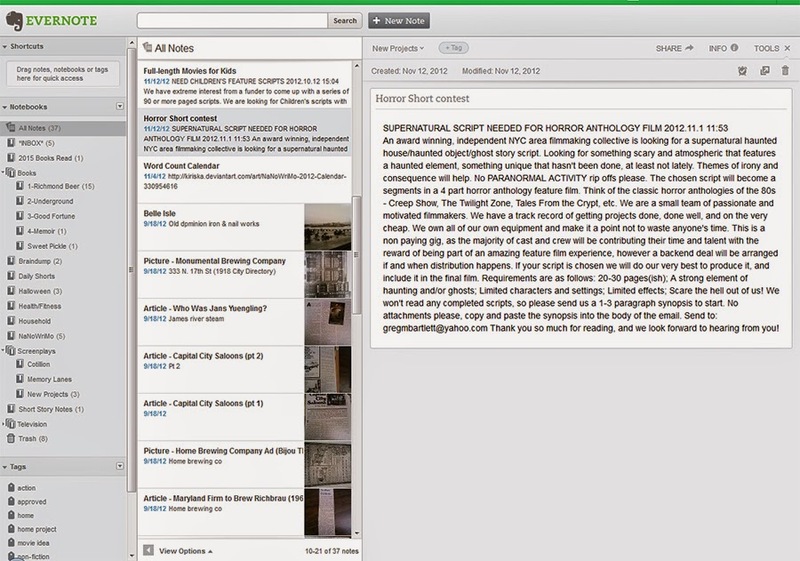 Here's where Evernote's famed flexibility enters the scene. You're not limited to text notes--photos, web snippets, PDFs, and audio clips can all be added to notebooks. See someone with traits you'd love to give a character in a story you're working on? Snap a quick photo and send it to your notebook. Stuck in traffic and have a great idea about a scene transition? Use your smartphone's audio recorder to capture your thoughts and then send the file to your notebook. Find something online that can help you fine-tune your story? Clip it with Evernote and send it to your notebook. Starting to get the feel for it? Great! It's worth the initial (and in my case clumsy) learning curve to really use the app to its full potential. I felt like I'd won the lottery when I first had the opportunity to use Evernote in the field for research and realized that my practice had really paid off. I was working on a new non-fiction book and was scheduled to visit a local research library and city archive that I'd visited numerous times before for other projects. During each visit I was required to lock up all of my belongings except for a pencil and paper before entering. If I needed copies of old newspaper articles or documents, I had to pay for them and wait until the archivist could have an assistant take the materials to a copy room and duplicate them. This sometimes meant that I had to go back the next day (or sometimes the next week depending on their workload) to pick up the items I needed. A new rule had been implemented since my last visit to the archive: visitors could now bring in a smartphone and use it to photograph research materials. Oh, this was big. HUGE. I snapped photos of newspaper clippings, historic images, handwritten letters, documents, and everything else I needed and sent them to my project notebook in Evernote. I was able to tag items in the app to make them easier to search later, and I've learned since that Evernote Premium automatically makes the text in photos of documents searchable without tags. In all, I saved about eight hours of writing notes with pencil in paper by hand and about $40 in copier fees just in that one visit. The app is free and you can access your notebooks and stacks from the web by logging in at evernote.com. Also, don't limit Evernote's capabilities to just your writing life. You can see in the screenshot above that I have a Household and Health/Fitness notebook to help me remember and organize my mind in those categories as well. What I've found over time is that the less I'm trying to juggle in my brain, the more my creativity can thrive. Now I let Evernote handle all of the details I used to juggle.